100 % Silk: We Use Natural Silk!Silk is a natural material made from the silk worms' cocoon. It's an animal protein fiber, just like wool or leather. Many people do not realize this characteristic for the magic of silk. Silk also has other valuable properties: it is insulating but breatheable. It is antimicrobial like wool. It is also hypoallergenic! It is lightweight but incredibly sturdy. After trying some of our beautiful silks, you'll become more confident that silk is an easy care, long-lasting and always well-spent purchase for personal use or gifts! The unit measure for silk is: momme, it is abbreviated as 'mm' and pronounced as 'mummy'. This term is used to distinguish the heaviness of the silk. Similar to ounces for cotton, momme is a weight measurement! Ultralight or featherweight silks would be any weight from 1-5mm, lightweight 6-8mm, blouse weight 12-14mm, dress weight 14-16mm, décor weight 18mm + up. Silk is a mystery all its own! It has a long and rich culture, full of history and contributions into its terminologies from all around the world! 17th century America gave silk manufacture a try, as well as France at a similar time. Introduction of the many specialty looms from France brought new terms and weaves into the culture: such as Crepe de Chine, Chiffon, Charmeuse…. Others terms have only come to mean what the weave is, not of what it is composed of. Damask is mostly referred to as only a weave, as is jacquard. But Chiffon could mean more than one thing. It is good to know the history of fabrics to understand more about them! 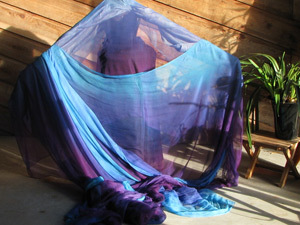 Chiffon, is an open-weave silk, that allows more light and air through. Many people are in error believing 'chiffon' is not silk. Or that it is vegan. Most items in our world sold as chiffon are not a true silk chiffon, but have come to mean a chiffon-type fabric, meaning the weave. 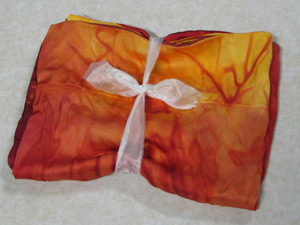 We offer True silk chiffon in 6mm weight x 45inch width. Many beautiful chiffons are orderable through swatches with intricate differences for custom projects. Chiffon has little body, conforming to every curve. Chiffon will shrink a lot in a dryer. 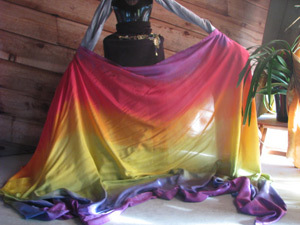 Chiffon takes bright colors with brilliant tones, and has interesting subtleties to soft blends. Gauze is like a very light-weight 'affordable chiffon' If you have projects or events needing to use LOTS of yardage, silk gauze might be just what you need! Crepe de chine is sometimes referred to as 'The Cadillac of Silks'. It has a smooth crepe finish, incredible Drape and Luster. Crepe makes lovely clothing garments. Dyes beautifully especially in our House Blends. We suggest trying our 54x72 Crepe Shawl. Charmeuse is what is in the silk world as REAL SILK SATIN. It comes in varying weights, but we carry it mostly in a heavy 19mm weight that is quite durable and luxurious. We stock charmeuse pillowcases, and also chemises in this fabric – these make well-received special occasion gifts! Just find their favorite colors! We'll do the rest… We also frequently use it as trim on the many dance & costume items we produce in-house. Velvet is usually a combination of silk 18% and rayon 82%. It takes dye brilliantly and with interesting natural effects. I have seen pure silk velvet only once many years ago from Pakistan. The Silk velvets are quite durable and washer friendly as well. 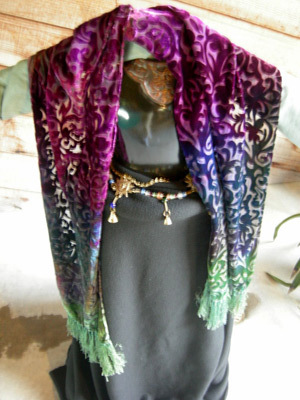 Try our Velvet Shawl. Shantungis an even-weave heavier woven fabric suitable for drapery, décor, and garments. It is often used in wedding dresses because it has such beautiful drape. It is heavy-bodied, which means it holds its shape nicely. 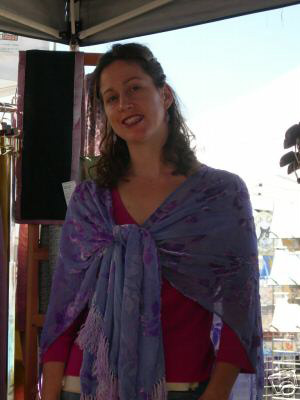 See our in-house 22x90 shantung scarves for a real treat! 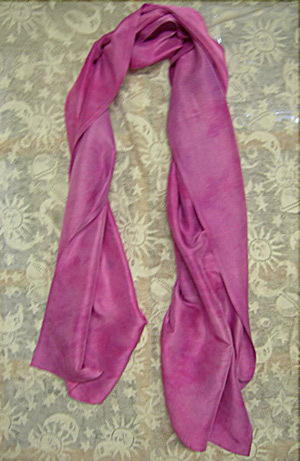 Dupioni is often what people also may think of with silk. It is a lustrous, woven silk that is often used for draperies, seen with uneven nubbiness, which are a byproduct of it being woven on heavier wooden looms.